We must also know the balance between incoming solar energy (which declines rapidly at this time of year) and outgoing infrared energy. 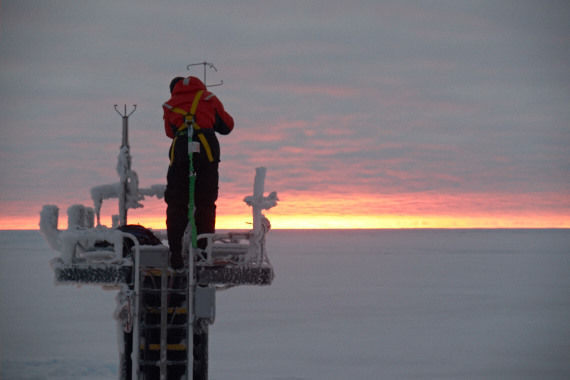 To assess the turbulent transfer of heat and momentum from the wind (which pushes the sea ice and creates waves) we employ fast sensors for wind, temperature and humidity taking 10 measurements per second. It’s not difficult to keep this gear running smoothly under normal conditions but the Arctic presents special challenges. It’s currently about -16 °C (3 °F) at mid-day and a few degrees colder at night. Freezing fog and light snowfall covers everything with feathery hoar frost and ice crystals. Many instruments fail under these conditions: Fast wind sensors (ultrasonic anemometers) stop sending data; relative humidity sensors ice up and stop responding to changes in air humidity; and radiation detectors covered in frost no longer accurately record the solar or infrared energy from the sky. Some sensors are designed to cope with these challenges. 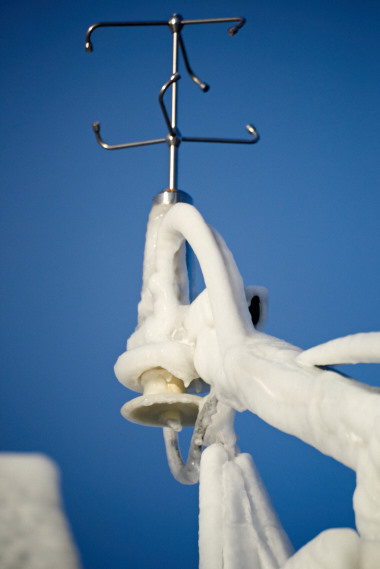 Our RH sensor and ultrasonic anemometers are heated to discourage condensation and ice formation (see photo of iced sonic anemometer). But the radiation sensors can’t be heated without biasing the measurement, so we resort to hand-cleaning them several times daily. I’ve been using hand warmers inside my gloves to gently melt off the ice. Two days ago our sonic anemometer on the ship’s bow tower stopped working and I had to climb up and replace it. Despite the cold I overdressed a bit and was sweating by the time the job was done. I also had a nice view of the morning sunrise (now about 10 AM local time).